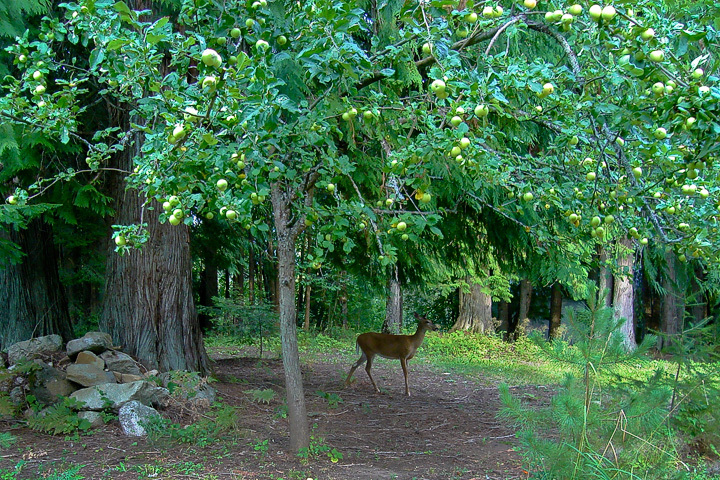 There are a great many apple trees around Kootenay Lake—a legacy of bygone orchards. It is likely that only the animals know the location of many of those trees now. In earlier years, I had casually watched one of the trees and had learned what others have long known: by the time the apples would have been worth picking, they were already gone. 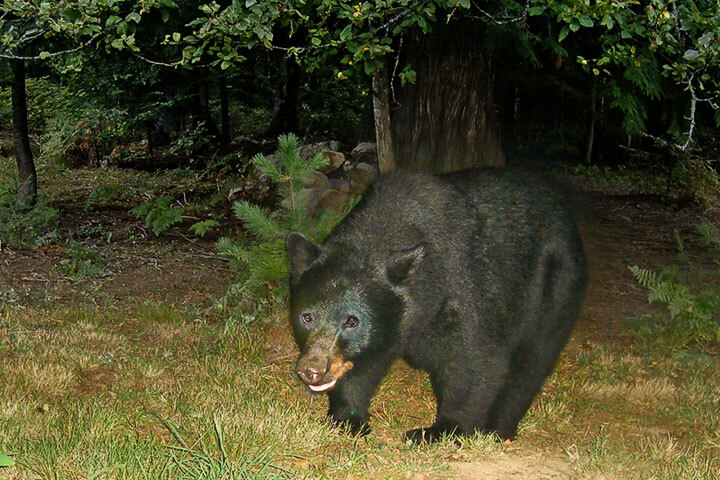 Each August, Bear Aware suggests picking fruit early lest it attract bears. So, is that what happened? Were all those apples taken by bears? Wouldn’t it be interesting to watch a tree for a while in the late summer to see what visits? 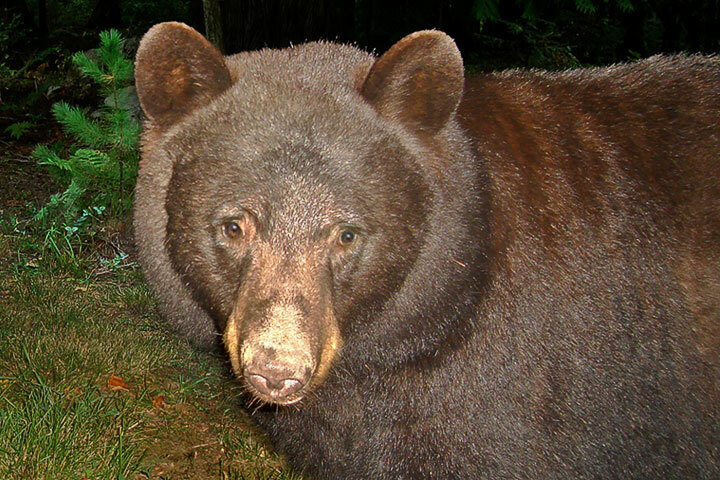 Not unexpectedly, bears did come—but, so did many other animals. Indeed, there is an extensive range of local wildlife which uses such a resource. Below is a sample of the apple raiders of Kootenay Lake. 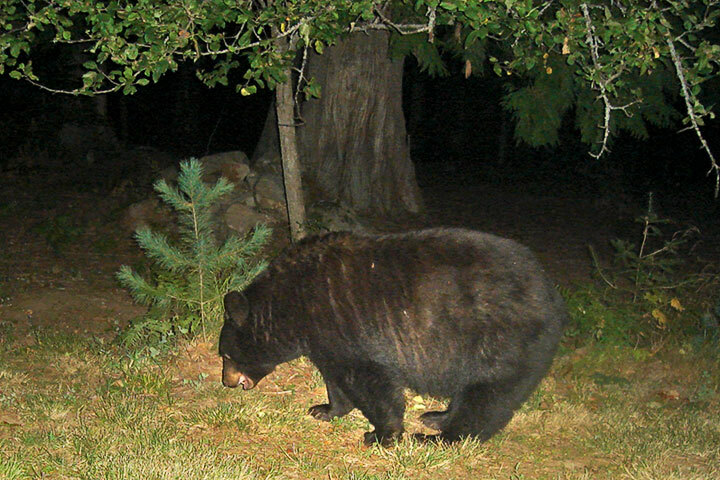 Perhaps the most intimidating–looking of the visitors to the little apple tree, this chocolate–coloured Black Bear visited early in September. 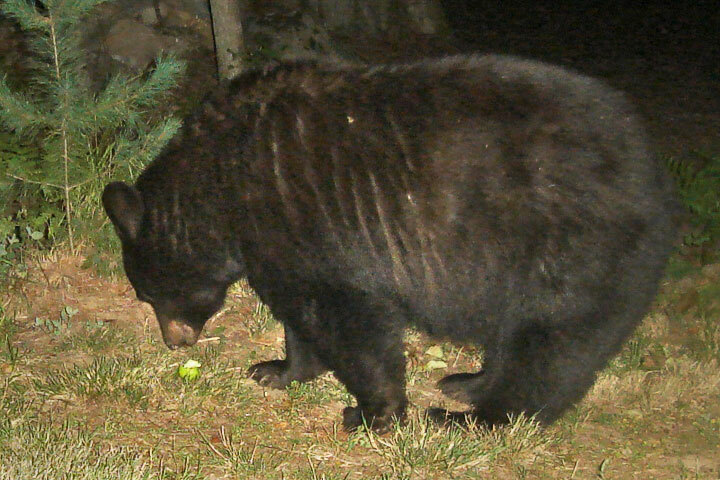 Moments after this picture was taken, the bear attempted to reach the fruit (below, left). 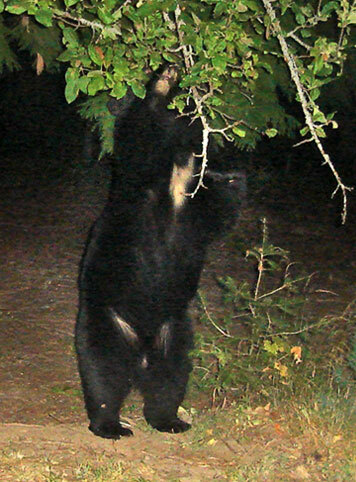 This is the same bear as above, now lifting a forepaw in a (failed) attempt to grab apples from the tree. Its darker shade merely reflects the inadequacies of the flash. Perhaps the earliest visitor of the season, and, indeed, the most frequent was the resident White–tailed doe. Well, I think that two different does visit, one with a fawn, one without. I don’t often see the fawn come around—I think its mother and it must live farther away than does the other doe. 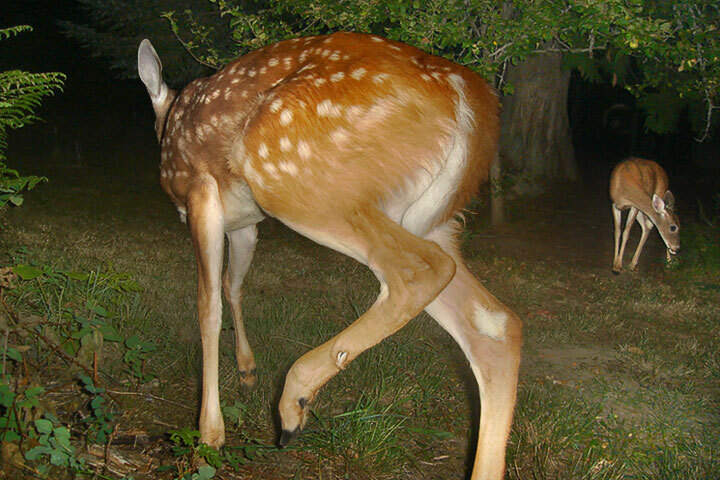 I have seen a doe get an apple off the ground that a bear had knocked down but then neglected. 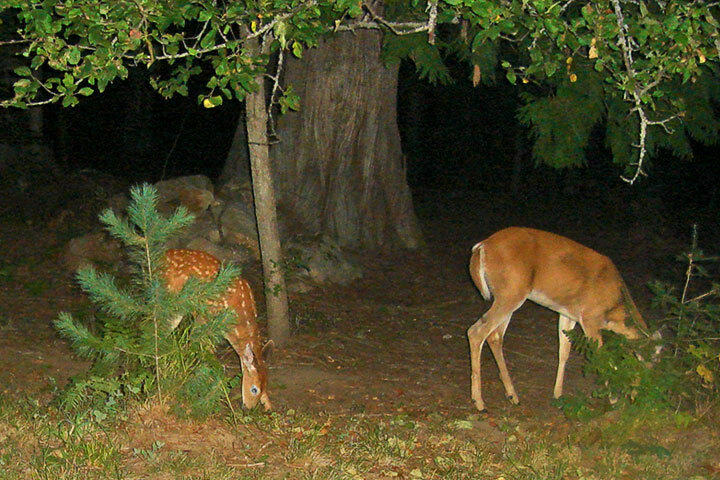 The doe and its fawn are exploring the ground below the tree. A bear ponders an apple on the ground below the tree. A moment later, the apple is gone (below). A moment after the picture, above, the bear has eaten the apple. 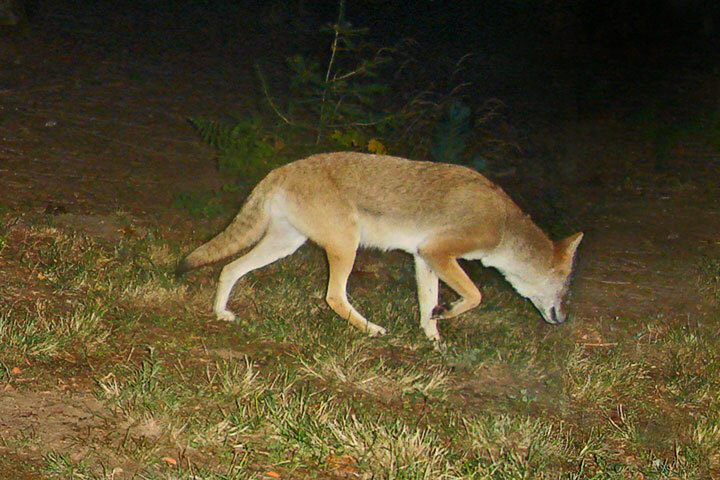 I would not have guessed that a Coyote would take any interest in an apple tree, but it has visited a few times. Of course, it may have been on the prowl for other things—but, there it was. Another frequent visitor is this White-tailed buck. It has to strain to reach the lower branches. 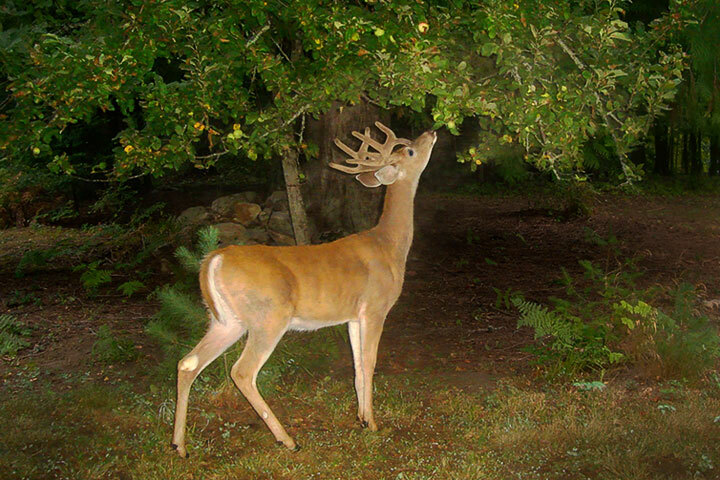 The buck came by for a nibble often enough that I managed to get it in this classic pose in front of the tree. If necessary stand and shake the branches. The bear got nothing—the tree was empty—but, still the bear came and tried. 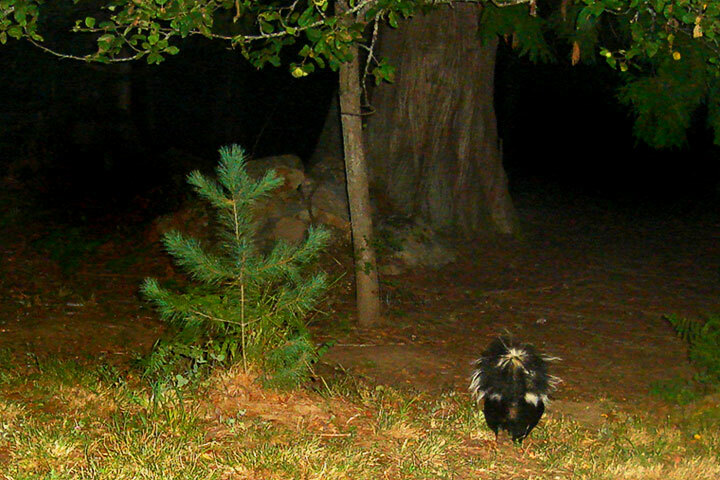 A skunk has rummaged around under the tree a few times. 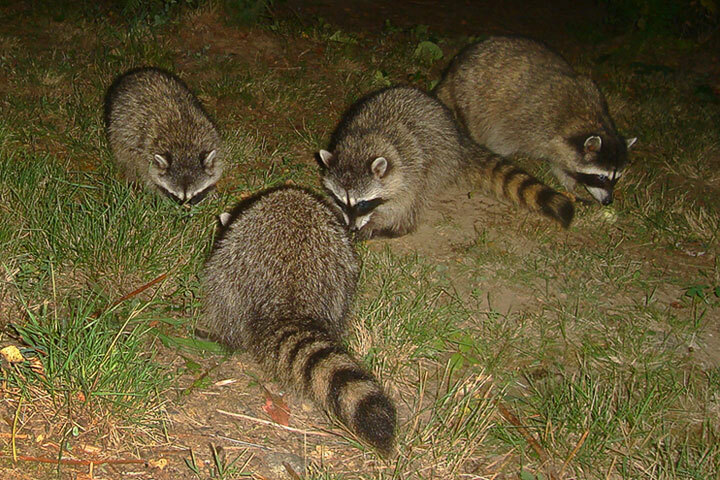 Raccoons seem to know a good thing when they encounter it; they visited frequently. After (seemingly) posing, this bear shook the tree and scarfed up some apples which fell—but left some which were soon eaten by deer. 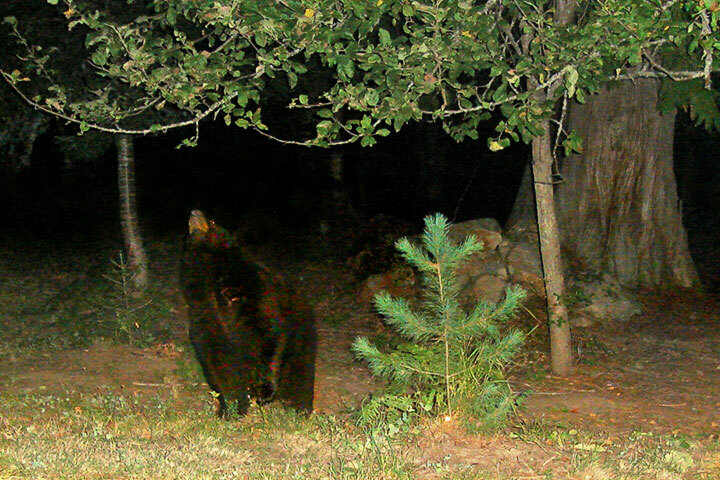 Despite the apparent shoulder hump, this is not a grizzly, but a black bear with an awkward stance. 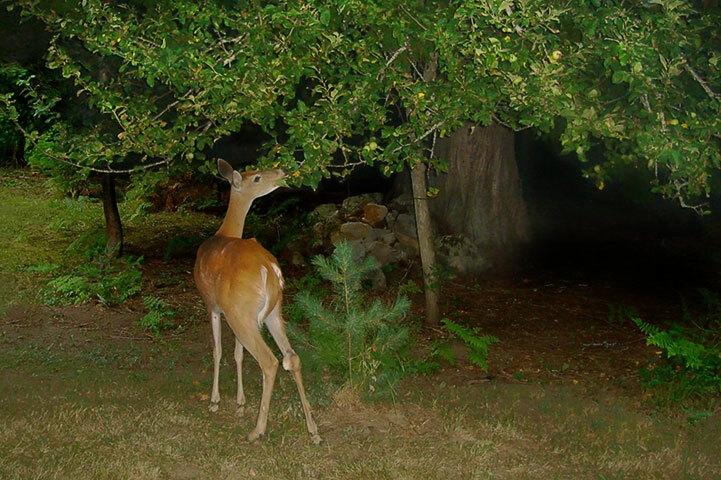 A white–tailed doe checks out the apple tree from a distance, and probably resolves to return at dusk. 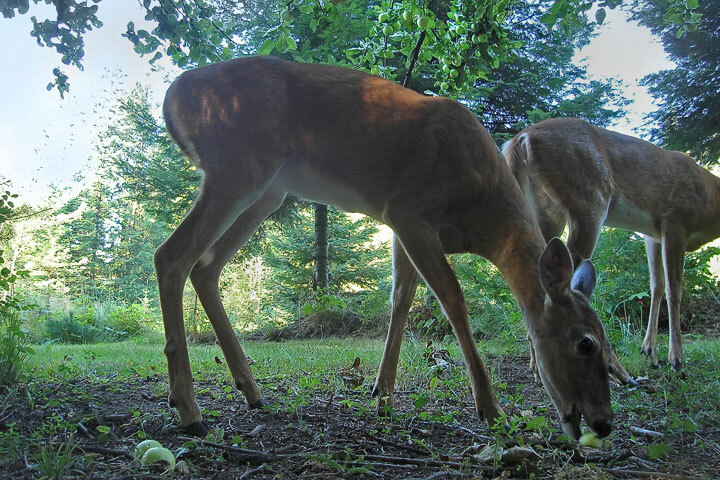 A couple of does munch on apples which have fallen from the tree. Get the Flash Player to see this player. 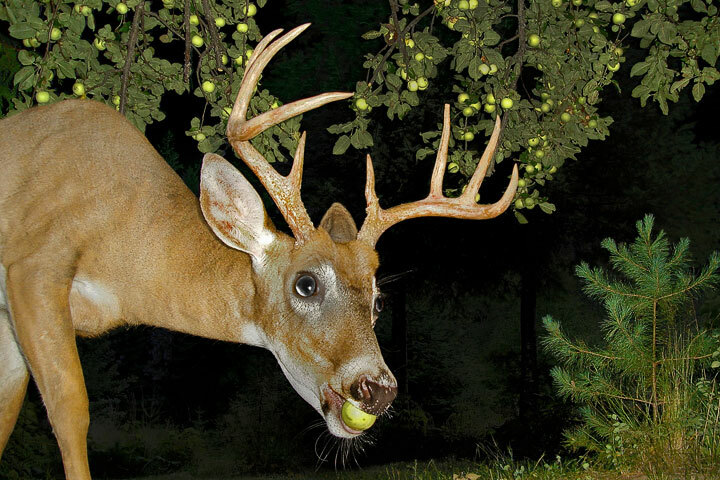 Click on the image and watch the doe eat an apple—it certainly does slobber. 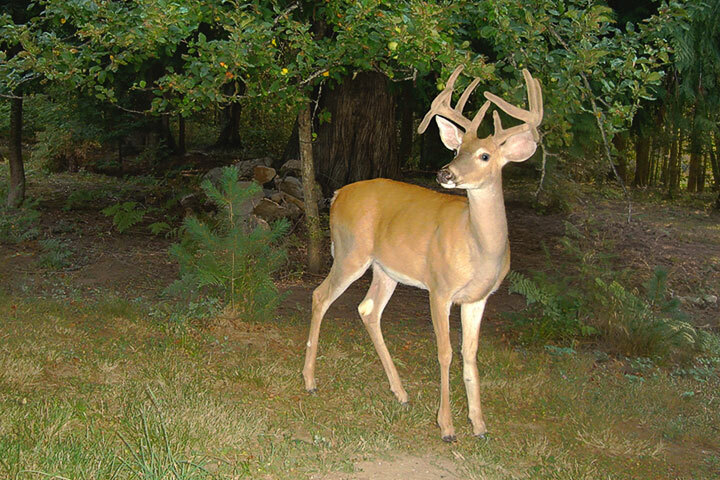 This white–tailed buck has been been caught in flagrante delicto.